"Academy Award/Emmy Award winning actor Karl Malden was my mentor. Starring opposite him in Streets of San Francisco, he taught me one of the most important lessons of my career - what matters most is to work to make the whole show the best it can be and then your own performance will shine. It was a valuable lesson I always keep with me whether producing or just acting in a film." 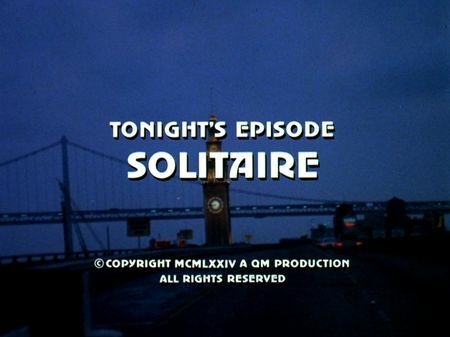 I have just added the screencaps for Solitaire to the episodes' page. When Mike and Steve are responding to a support request, they are literally clopping into a drug deal that just went busted. Mike traces a suspect who is trying to get away but finally nails the guy, whereas Steve is shot down by another runner. It turns out that Mike actually booked undercover narcotics officer Albert Wozynsky who was about to capture local drug lord Marks. Upset by the burst takedown, independent-minded Wozynsky rants about Mike's and Steve's 'support' but due to Steve's injury - and much to the displeasure of both - Wozynsky and Mike are teamed up in order to finally take down the drug ring. Things are getting rather difficult as Wozynsky turns out to be a lone fighter who thinks that Mike's methods are old-fashioned and conspicuous - in any way disturbing his undercover work. Following the murder of one of Wozynsky's fosterlings, the atmosphere is getting even more heated up. Due to an informer's tip, police is setting up a trap for Marks but the operation goes wrong last minute after Wozynsky had left his position. Mike is upset and suspects Wozynsky to be on the racket. In the meantime, Steve tries to find out some background info on the drug ring and recent busts - delivering even more indication that Al Wozynsky might be involved. Little do Mike and Steve know that Wozynsky is about to put his life at stake in order to finally catch Marks. There is quite a number of different filming locations for this episode. It starts out at an old warehouse where Wozynsky meets Marks - and where Steve is injured. This warehouse was located in the Dogpatch on Indiana Street, right beneath the 20th Street overpass which can be seen when Mike and Steve are approching the scene (this warehouse was used before in season 3 episode Cry Help!). Steve is taken to hospital, the initial footage shows a hospital's facade of unknown location (also used in season 1 epsiode Legion of the Lost) but, later on, all exterior and interior sequences were taken a CPMC's Davies Campus on Duboce Avenue. Wozynsky meets Artie at the backyard basketball playground at St. Paul's Catholic Church in Noe Valley, and then he and Mike talk to informer Stoolie as well as Artie's girl friend, Millie, at the corner of Haight and Fillmore Streets. Millie's apartment is located in the Lower Haight, and police is trying to set a trap for Marks upon the delivery of a drug consignment at the Fort Mason pier. Steve talks to Al's former girl friend at Jackson Street and Davis Court, and later on to Parson on the rooftop playground of the Wozynsky brothers' former children's home in the Pacific Heights, whereas Al visits his father at the Laguna Honda Hospital. In a desperate effort to take down Marks, Wozynsky bolts in a street dealing of one of Marks' dealers on the Market and Romain pedestrian stairway whereas Marks' mansion is located in the Marina. In the epilogue, Mike and Steve are driving up to Lower Pacific Heights where Mike proves his improved undercover techniques when booking Al Wozynsky feignedly. Another two of the few yet unidentified filming locations were recently uncovered - thanks to the help of fellow fans Jonathan from San Clemente (again! ), and Brad from San Mateo. Jonathan did an amazing research to identify the location of the warehouse in season 1 episode Deathwatch, which was used to deploy the illegal immigrants. We initially suspected the location to be somewhere in South San Francisco but, finally, Jonathan took the 'Levitz' sign that can be seen in a distance as a 'major marker' and found the location in Southern California. This segment was actually filmed in the Los Angeles area - in West Glendale, to be precise - which makes it one of just a handful of sequences that were not filmed on location in San Francisco and the Bay Area. Brad contributed to season 2 episode Betrayed, starring Martin Sheen as the charming stock exchange broker Dean Knox who has got an affair with the attractive daughter of a successful business man. Their remarkable mansion's location was identified to be in Atherton, just south of San Mateo. I actually think they used two different mansions for the filming here: it appears that the cottage-style mansion right at Valparaiso Avenue and Park Lane was used for the initial driveway scene whereas the pool scene was obviously filmed on the property right behind it. I would like to encourage you all to check out the unidentified filming locations page so that we can solve the remaining mysteries. I do appreciate your help! 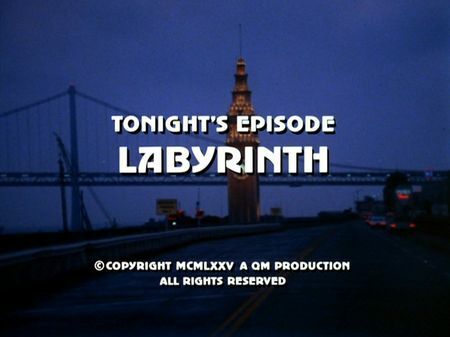 I have just added the screencaps for Labyrinth to the episodes' page. A trio of the mob's henchman is spreading into 'Hotel Pierre', chasing over-the-hill boxer Tony Farbreze who is hiding in the luxury-class hotel after he had double-crossed his mob controllers by knocking outcoming future champion Eddie - against the mob's directive. The trio, however, is identified by hotel security coordinator Al Ginnis, an ageing man and former SFPD police officer who traces the trio up to the seventh floor where Fabrieze has accommodation. Instead of taking immediate action Ginnis ends up freezing in this tracks, outside Fabrieze's room, whereas the rumble inside is going on. Fabrieze tries to explain that he just couldn't lose the fight in St. Louis after he spotted his little son among the spectators, but the trio won't let him go. After one of the mobsters ends up going through the window, still with his brass knuckles on, Tony is shot but the boxer makes it out of the room after knocking out the other two henchmen. Slowly bleeding to death, he takes swinging couple, Judith and Pete, hostage in their room, trying to find a solution. Meanwhile, police arrives on the scene, cordoning off the complete hotel after Ginnis informs Mike about the observation he made. Knowing Al Ginnis from his earlier service on the force, Mike demands Ginnis' help, unconsciously giving him a moral uplift. Harry and Jack, the two remaining mobsters, are trying to get out of the hotel but they cannot find a way out. Soon after he got busted in the hotel's laundry, gangster Harry uses an accidental chance to take Mike hostage, requesting a chopper on the hotel's roof top. Steve is waiting for a chance to rescue Mike, and just before Harry tries to open the helicopter's door, he takes the chance to end this nightmare. A happy end is waiting for Tony Fabrieze whose son is waiting for him at the hotel's gateway before he is taken to hospital, and also for Judith, who helped Tony by letting Mike and Steve know about the severely wounded man in their room; Steve lets her go without any further questioning which she was afraid could uncover her love affair. This is the very first episode filmed on one and the same location. 'Hotel Pierre' as given in the script and indicated by the logo attached to the entrance canopy actually is the Brocklebank Apartments building on Nob Hill, possibly chosen due to a certain resemblance with the exterior gateway of famous Mark Hopkins Hotel which is located only one block away. The rooftop scene toward the end of this episode, however, was filmed on top the Alameda County parking garage in downtown Oakland, featuring its typical elliptic helicopter platform. Season 4 Ep Summaries Added! I have added the short summaries for all season 4 episodes to the episodes' page. Now that I am about to finish the screencapturing work and extended summaries plus filming locations info for the final season 3 eps, you can now (p)review the plot of next season's episodes in the familiar shortcuts. As I mentioned in an earlier blog post, most of these short summaries are basically taken from the official Worldvision press kit that was issued with the release of the series' video edition. Short summaries for season 5 episodes will be supplemented once I have completed the screencapturing and extended summaries plus filming locations info on season 4 episodes. By the way, the screencaps for the next due episode, Labyrinth, are in the works already and will be added next week. ABC Press Photos Ready to be Given-Away!